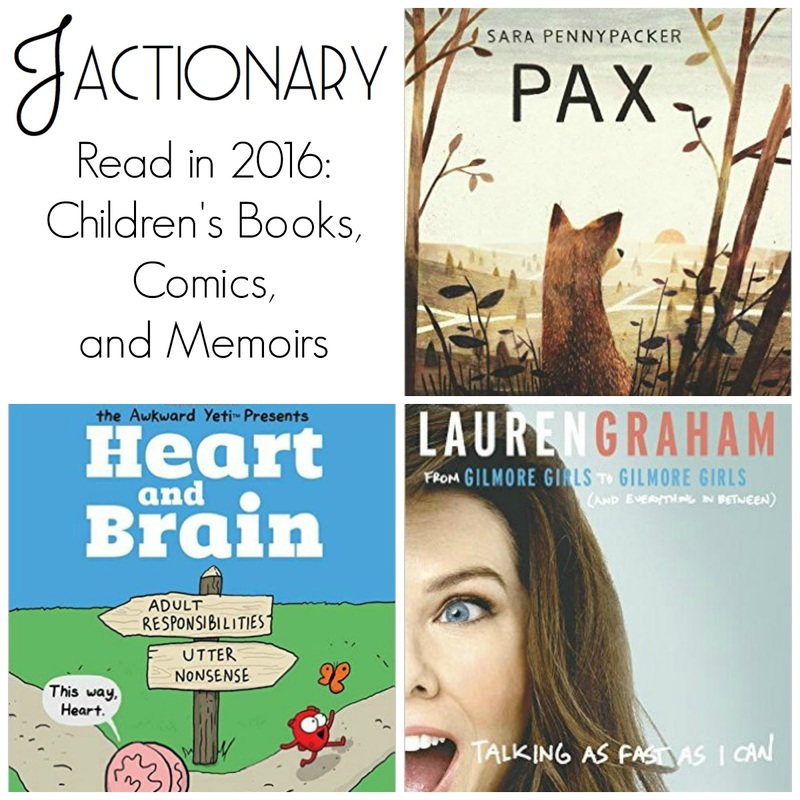 Today is the second part in a series of posts about all of the books I read in 2016. 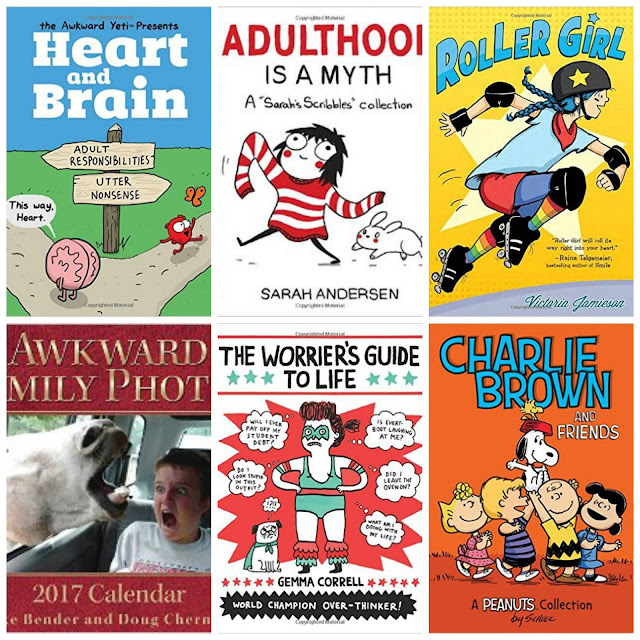 This post highlights the 8 children's books, 6 comics/graphic novels, and 13 memoirs I read last year. I've sorted them by genre and then by my Goodreads rating (a scale of 1-5 stars, 1 being I didn't like and 5 meaning it was amazing). [5 stars] A childhood favorite full of deliciously ridiculous made-up words. Read my full review. [4 stars] I reread Hatchet after learning it was actually the first of several novels about Brian. Along with My Side of the Mountain and The Long Winter, The Hatchet held a strong place within my child imagination of outdoor survival. Has anyone else read the whole series? How did I miss this? 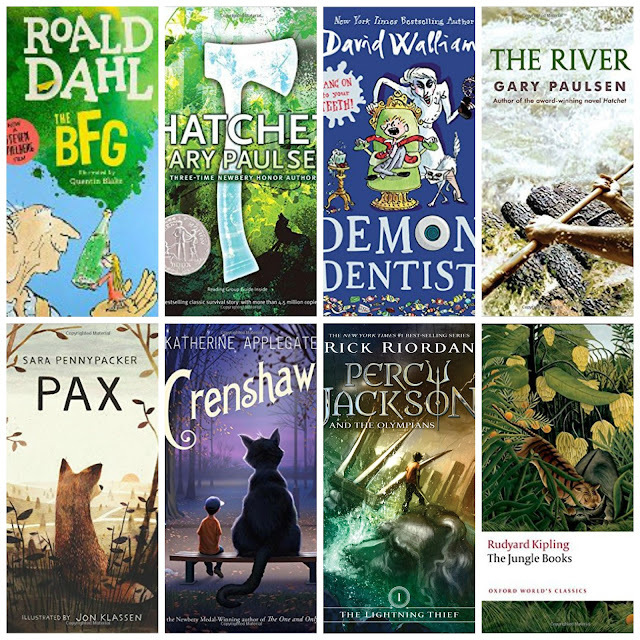 [3.5 stars] A funny middle-grade novel very reminiscent of Roald Dahl. [3 stars] Basically a repeat of Hatchet, so is it good or bad luck to be with Brian in the middle of nowhere? [3 stars] I completely understand why early reviewers hate the ending to this book, but I though it was absolutely the best and most poetic outcome for the story. [3 stars] The writing has its flaws, but the messages about trauma and mental illness/escape are great for child audiences. [2.5 or 3 stars] I liked the use of mythology and the premise is fun. At times the plot is kind of silly, unimportant events are described in great detail, and three or four major elements in the climax/conclusion happen far too quickly and easily. [2.5 or 3 stars] I thought I'd enjoy this book even more this time around, but I still feel the about same. The first two stories in the collection (the ones featuring Mowgli, Baloo, Shere Khan, Kaa, and company) are great, but generally the rest are OK but less engaging to me. [4 stars] Definitely one of my favorite current cartoonists. I love Heart and Brain and got their 2017 calendar for Christmas. [4 stars] Very funny and very accurate. [3 stars] The funniest section is themed "Strange not Awkward." [2.5 stars] Not as funny as I thought it would be given that I enjoy her comics and Instagram feed. Many more misses than hits, but when she nails it her comics are perfection. [2 stars] Not the best Peanuts collection: 80% baseball comics and not nearly enough Snoopy. [4 stars] Delightful. 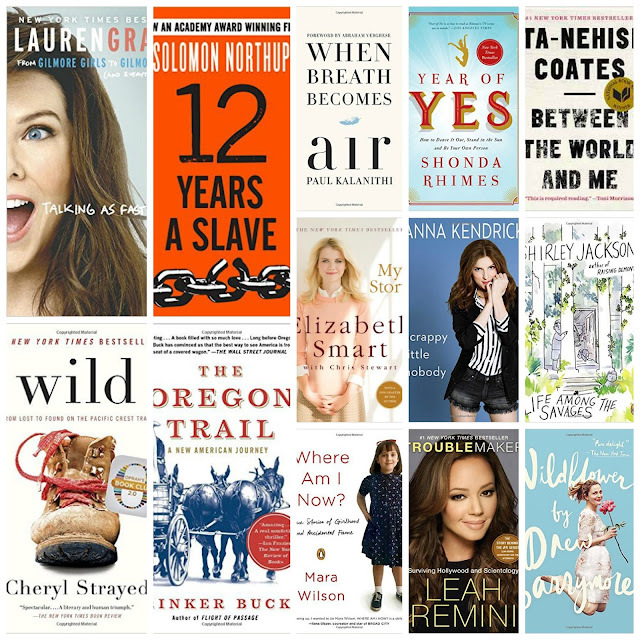 As a Gilmore Girls and a Lauren Graham fan, it was fun to listen to the audiobook and feel like I was getting to have some one-on-one time with her. [4 stars] Solomon Northup was a free black man who was kidnapped and sold into slavery. After twelve years of horror, he was finally rescued. This is his autobiographical slave narrative, published in 1853. Along with Frederick Douglass, Harriet Jacobs, and many others, these accounts are crucial to read, remember, and share. As you'd expect, the scene of his rescue is particularly emotional. [3.5 stars] If the entire memoir were about her mourning the loss of her mother and her time on the trail, I'd rate this higher. Unfortunately, much of the book is littered with her unfailingly poor judgment, finger-pointing, navel-gazing, terrible relationships, drug use, rough language, etc. It's a bit of a pendulum ride. [3 stars] Part memoir of his relationship with his father, part expedition to travel the Oregon Trail in a covered wagon. Interesting enough, but so, so much cursing cheapened it. [3 stars] Increasingly powerful, poignant, and sad as the author's cancer spreads and he bares his fears and vulnerability. You'll need some Kleenex at the ready. [3 stars] Another strong anthem for women to love and support one another, dream big, work hard, and face your fears by saying "Yes!" to new opportunities and adventure. [3 stars] A powerful love story from a father to his son about racism, finding strength, and finding identity and place in an unfair world. [3 stars] I admire Elizabeth Smart's survival and applaud her work as an advocate for victims of sexual abuse and abduction, though I didn't like some of the narrative choices in the book. [3 stars] Sassy and funny when she's not detailing her love life (which unfortunately is much of the time). Not knowing anything about her theater background and childhood, I did gain respect for her long career and liked hearing her humorous dishes on celebrity behind-the-scenes life. [3 stars] Signature Jackson style as she uses her dry humor to paint a portrait of her life and marriage raising four young children. The funniest stand-alone excerpt is her puzzled reflections on her family's sleep patterns and a missing blanket. [2.5 stars] Engaging when she's writing about her childhood celebrity and her relationships with both the actors and characters that informed her youth but this makes up only half of the text. [2 stars] I sped through this, skimming sections that were more about her childhood and professional and instead focusing more on chapters about her former religion. Her experiences with the behind-the-scenes workings of celebrities and Scientology are definitely interesting, but overall I didn't love her narrative voice. [2 stars] I think Drew is funny and charming, but this collection of stories was just okay. Do you have any children's, comic, or memoir recommendations?